Oups, I got the wrong link on Katarina in my previous post! Thank you wrong Katarina hype knitting blogger to let me know! Katarina Brieditis is also Swedish and a designer who uses a lot of different textile techniques in her work. Knitting has followed her through life and has resulted in several exhibitions and two books: Lust att Sticka (2000) and Do Redo the art of slaughtering a sweater (2004) (English edition: Second-time Cool – the art of chopping up a sweater, Annick press 2006), a book connected to the handicraft and recycle project Do Redo, that started in 2003 with four others. 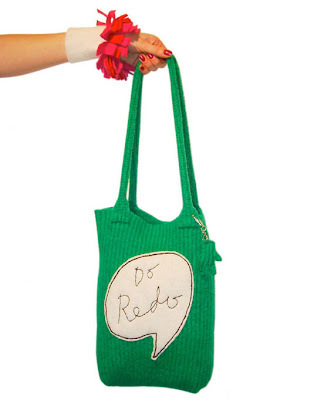 Do Redo stands for "do and remake" - use old traditional techniques in new ways, re-use material and do something new out of it. Do and do it again, never give up!